Howe led a survey of three rock shelters in March, April, and May, 1962, on land owned by Howard E. Stilwell of San Gabriel. Howe took photographs on the trips (Apostolides, 1968a) but there are no photographs of the March or April trips in this collection. 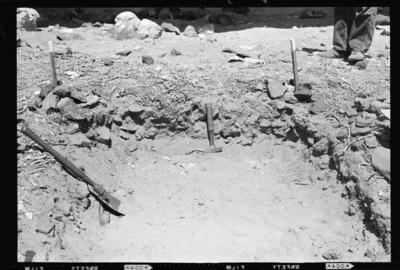 Photographs include views of “Excavation by South West Museum” including two signs at the site “62-S 5-5-62 SR-2 6 inches N-125” (ASA001-1511) and “62-S 5-6-62 SR-2 Charcoal lens N-125” (ASA001-1513); landscapes; and people working at the site. 2.25x3.25 negatives.